This is a collection of science fair research ideas and a showcase of Muntinlupa National High School students' investigatory projects, with the objective of promoting scientific research among the general public. The entire write-up for every project is NOT displayed for copyright purposes; only RANDOM parts of the project are shown instead. Further questions about the projects presented should be directed to the researchers or the project adviser. FEEL FREE TO BROWSE! Anthracnose is a common and serious disease of plants in tropical region and humid areas. It is a fungus that causes heavy and deep damage to tomatoes making it easy to rot. Growth of Anthracnose (C. Coccodes) is most rapid at 80° F, although the fungus can cause infections over a wide range of temperatures (55°-95° F). Wet weather promotes disease development, and splashing water in the form of rain or overhead irrigation favors the spread of the disease. 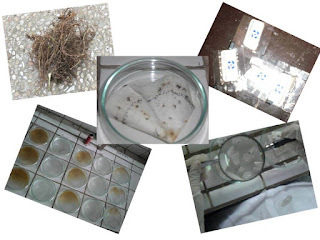 Colonies as observed by the researchers are usually dark pigmented with white aerial vegetative part of a fungus which is called mycelium. Consisting of numerous black compact mass of hardened fungal mycelium containing food reserves (sclerotia) and light brown colored conidial masses, reverse is a dark brown conidial masses. It is also a result in wide range of symptoms like leaf spots, defoliation and distortion in many different kinds of plants. One of the plants that is affected by this kind of fungi are tomatoes. The researchers have come up with the idea of using Madre de Cacao (Gliricidia sepium) leaf extract on post-harvest Tomatoes (Solanum lycopersicum). The study ascertained that the medicarpin content of the said plant is an effective treatment for fungi. Since Gliricidia has already proven its power on fungal infections, the researchers conducted several experimentation and trials to figure out its effectiveness; with this, Anthracnose can now be prevented and cured without the help of commercially known anti-fungal treatment. slime and converted it into a very useful product. slime and 1.6 grams wet filter paper; 5.6 grams dry slime and 1.6 grams wet filter paper. effective moisture absorbent, especially the wet mucus. Due to the high cost of the commercial medicines, people are incited to discover and seek for an alternative way to cure particular ailments by the utilization of medicinal plants. People in rural places and those who cannot afford to buy expensive topical treatment for skin diseases need to discover what nature can offer as alternative medication. Ashitaba (Angelica keiskei) is a plant that is abundant in many regions of Asia. It was first used in Japan as herbal tea for treatment of different diseases, and it multiplied rapidly, particularly in the Philippines. Subsequently, the researchers studied the beneficial uses of the Ashitaba (Angelica keiskei) leaves, specifically its capability to treat wounds. A total of four sets of experiments are prepared. Three (3) mice per four (4) different kinds of set-ups. Pure Ashitaba (Angelica keiskei) extract and decocted Ashitaba (Angelicakeiskei) extract served as the experimental set-ups. Betadine (Povidone-iodine) and the untreated set-up served as the control set-ups. The results of the experiment revealed that among all the treatments, 100% Angelica keiskei pure extract had the highest rate of wound healing in albino mice. Next were the Povidone-iodine and the decocted extract of Angelica keiskei, which were at the same level of efficiency. Statistical analysis showed that there’s no significant difference between the experimental set-ups (Ashitaba leaf and stem pure extract, and decocted extract) and the control set-up (Povidone-iodine) in terms of wound healing rate. Macasinag, John Paulo H.; Joson, Jonas S.; Pante, Jonel B. Production of green energy from indigenous materials has played an essential role in recent days due to the depletion of non-renewable energy resources. Viable alternative sources of energy have long been searched for in the midst of the increasing demand of for fossil fuels. People are already upset by the high fuel prices, and in reality they are likely to go much higher in the future. Thus, an alternative fuel source such as bioethanol can save the consumption and dependency on fuel wood. Aritilis (Muntingiacalabura)is a fruit-bearing tree that is abundant in many regions of the Philippines, and because of its plentiful growth, it is sometimes considered as nuisance whenever it produces too much waste on the ground where it falls off. This made the researchers decide to use aratilis fruit as the main material in producing bioethanol considering that it is rich in starch that is convertible to sugar, which is then processed to become bioethanol. Bioethanol is a renewable fuel source. It is produced from plants that process and store energy from the sun. In a sustainable cropping system, plant feedstock could be produced year after year. Regions of the world that were without crude oil deposits could consider fuel farming as a long term solution to offset their energy needs and foreign oil dependency. Bioethanol can be made from common crops such as sugar cane, sweet sorghum, and the like; unlike petroleum which is produced from agricultural feedstock. It burns more clearly and produces very little amount of carbon monoxide which can help in reducing pollution in our country. It is also renewable, making it more practical and affordable. Aratilis fruit is a starchy substrate which can be utilized for the production of green energy, bio-ethanol.Ethanol from starch is generally produced by the fermentation process.In order to produce ethanol from starchy material, the starch must first be converted into sugars. One of the reasons for rice shortage in the country is pest infestation, specifically, by Rice Black Bug. The researchers were challenged to come up with another method of combating Rice Black Bugs in the rice field, without altering the balance of nature. Upon seeking ways to exterminate these unwanted pests, the researchers investigated the exterminating property of Cane Toad (Bufo marinus) crude extract against Rice Black Bug. The pesticide was derived from the extraction of the 22.5 grams of crude extract. The following experimental set-ups had been made: 30% crude extract and 70% corn oil solution (0.3 grams of crude extract and 0.7grams corn oil solution); 50% crude extract and 50% corn oil solution (0.5 grams of crude extract and 0.5 grams corn oil solution); 70% crude extract and 30% corn oil solution (0.7 grams of crude extract and 0.3 grams corn oil solution. ); and 100% crude extract (1 gram of crude extract). Using the different concentrations, the effectiveness was tested to the Rice Black Bug (Scotinophara coarctata), in terms of mortality rate. T- test showed that there was no significant difference between the experimental product and the commercial bug killer in terms of the pest’s mortality rate, at 0.05 level of significance. The results of experimentation and data analysis showed that the experimental product was just as effective as the commercial bug killer in eradicating pests. Thus, the organic pesticide obtained from Cane Toad (Bufo marinus) crude extract could be an alternative to the commercial bug killer. "RESEARCHER OF THE YEAR 2009"
The researchers aimed to determine if the Talisay (Terminalia catappa) leaves extract could be developed as a multi-colored fabric dye. 1. Can Talisay (Terminalia catappa) leaves extract be developed as a multi-colored dye? Children during their early stage of learning are curious on how things around them work. They always want to play outdoor games such as tumbang preso, patintero, piko, jolens, pogs, and many other games with their playmates. These games require touching and a lot of barefoot running. Children do not tend to know that running barefooted will cause the formation of ascaris and other parasitic worms that might infect their intestines. Malnutrition surrounds our country today; a lot of people, most especially the children, were the victims of it. One of the most common causes of malnutrition of children is worm infestation. Worm infestation can result if there happened to be a direct or indirect contact with the feces of an infected person. It can be dispersed when the feces of an infected organism are used as fertilizers in farmlands that are now converted into urban type of community. The kids that are living in that converted area can accumulate the infection that the former farmland has. Children that are infected can have parasitic worms inside their bodies. They can eventually experience malnutrition and other health deficiencies if not treated. Purgative medicines are cheap in cost but children dislike the taste because of its bitterness. The researchers came up with this project due to the desire of helping the parents of infected children in convincing their kids to take good-tasting purgative remedy that is cheaper in cost and can be done at home. The researchers found out that pounded and boiled akapulko seeds are used as an effective purgative agent. Akapulko is an herbal plant that can be used in curing skin, stomach, lung, and mouth problems, and is well known for its sudorific, diuretic and purgative characteristics. It can be ingested without having any side effect or contraindications. The researchers thought of pulvoron, being a healthy, delicious, and attractive treat for all. The akapulko seeds were consider as extender in place of the traditional rice crisps, nuts, or nougats in the pulvoron. Established that akapulvoron could be an effective and safe purgative treat, the researchers intended to conduct a sensory analysis of the product to determine if it would be generally accepted by the public. 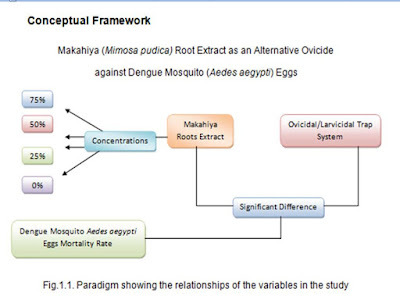 The augmenting number of Dengue cases not only in our country but also to other countries all over the world experiencing the abnormal change in weather is not of recent origin to us. Along with this difficult situation, there are two-winged, dipterous insects that hatch their eggs for a short time, reducing the size of their larvae and become “nervous-biters”. In that case, they are harder to intercept in flight that is why it is more advisable to focus on the places where they lay their eggs. The researchers conducted this study in order to lessen the proliferation of mosquitoes or prevent the eggs from hatching using the Makahiya Mimosa pudica roots extract as an ovicide. As the experiment was proven to be effective, it is relevant to propagate the plant for mass production and communicate the results to other people. It is also significant to conduct experiments about the other potentialities of the said plant, such as the anti fertility property of its root extract which was proven in Albino white mice sperm cells according to Dr. Godofredo Umali-Stuart of University of Santo Tomas. Who have benefited from the page? Copyright 2018. All Rights Reserved. Simple theme. Theme images by gaffera. Powered by Blogger.